One dozen of the most luxurious red roses. The luscious deep red colour of the roses is complemented perfectly with an array of gypsophila and seasonal foliage. 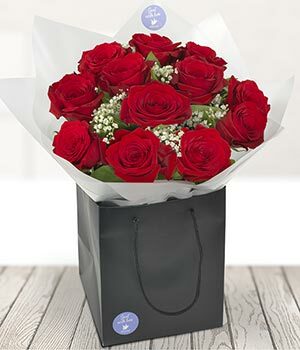 A dozen red roses says more than 'I Love You', it says 'Be Mine Forever?'. A perfect romantic gesture, this elegant bouquet is expertly crafted by a local florist and hand-delivered to your recipient.